Long-lived collaborations in academia are rare, and successful female researchers in statistical and math sciences are far from commonplace. So the trio of female scientific collaborators in the Department of Biostatistics and Bioinformatics, Rollins School of Public Health, is something of a phenomenon. 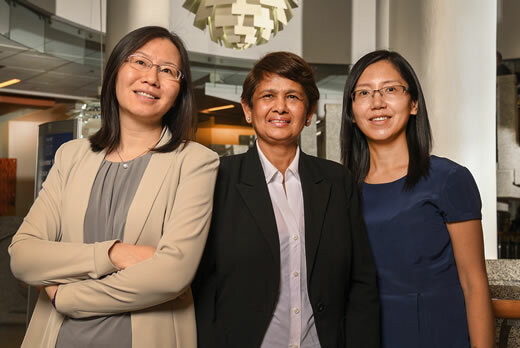 Biostatisticians Amita Manatunga, Limin Peng, and Ying Guo have been working together for more than a decade, publishing eight to 10 papers a year, each taking turns as lead author. They are frequent presenters at national and international conferences, and they have developed statistical software that is now publicly available. "These are three very strong individual scientists, but when they work together, they are particularly productive," says Lance Waller, chair of the department. "Their joint work is a role model for the rest of us." Their collaborative research, funded by the National Institute of Mental Health, focuses on redefining the diagnosis system for mental disorders. Currently, anxiety, depression, post-traumatic stress disorder (PTSD), and other maladies of the mind are diagnosed via clinical and self-evaluation. With advances in biologic measurements, brain imaging, and behavioral assessment, Manatunga, Peng, and Guo are searching for the biologic underpinnings of mental disorders, which could transform diagnosis and treatment. Their research falls under the NIMH Research Domain Criteria framework, which aims to integrate many levels of information for transforming understanding and treatment of mental illnesses. Toward that end, the three have been working with Tanja Jovanovic (psychiatry), director of the Grady Trauma Project, which studies PTSD in a civilian, inner-city population. Jovanovic has gathered a large amount of data about her study subjects, including genetic information, clinical measures of depression, patient self-report, clinician-administered PTSD interviews, trauma history, brain scans, levels of stress biomarkers in the blood, and fear-potentiated startle responses. The biostats trio is trying to find a way to merge and interpret these disparate sets of data that could allow for an objective and refined diagnosis of PTSD. In one study, Manatunga, Peng, and Guo looked at the incidence and degree of childhood trauma—sexual, physical, and emotional abuse and emotional and physical neglect—and current PTSD symptoms. They were able to identify four classes of PTSD subjects: high childhood trauma/high PTSD symptoms; low childhood trauma/high PTSD symptoms; low childhood trauma/low PTSD symptoms; and moderate childhood trauma/low PTSD symptoms (a resilient group). Now they are trying to develop new statistical methods that could allow them to identify neuroimaging or biologic biomarkers corresponding with the different classes as well as with other traditional clinical scales of mental disorders. "Bringing these different types of data together poses a lot of statistical challenges," says Peng, in a massive understatement. The three scientists each count their collaboration as a career highlight and credit its success to their different areas of expertise. "We each bring different skills to the table," says Manatunga, who has mentored both Peng and Guo. "Limin has a strong mathematical background, and she brings a very sophisticated knowledge of mathematical theory. Ying brings strong bioimaging expertise. And I have a long background in working with a variety of psychiatrists studying mental health issues. We need all three of us to succeed in the complex problems we are facing." Beyond their areas of expertise, the three simply enjoy working together. "We formed this group very naturally," says Guo. "We are friends personally, good colleagues, and we share similar interests. We have a very good chemistry. I'd say we have a pretty unique group."